At the end of 2017, Bloomberg Businessweek published an article titled ‘We’re Going to Need More Lithium,’ which outlined the challenges currently facing the global lithium industry as demand for the rare earth has surged over the past few years thanks to a spike in demand for electric vehicles, which are now competing with laptops and smartphones for lithium-ion batteries. A Tesla Model S uses more lithium in its batteries than 10,000 smartphones according to estimates by Goldman Sachs. Rare Earths Miner With 100% Upside? According to Bloomberg New Energy Finance, electric car production is expected to increase more than 30 fold by 2030, which means that the demand for lithium is not going to slacken anytime soon. Estimates vary but as Bloomberg reports, according to analysts at researcher Sanford C. Bernstein & Co., “total investment in new mines, including some for other elements used in lithium-ion batteries, will likely range from $350 billion to $750 billion” over the next 12 years. The good news is, there’s plenty of lithium to go around. Bloomberg New Energy Finance estimates that production required over the next dozen years will drain less than 1% of global reserves. Demand for lithium has pushed lithium prices steadily higher (doubling over the past two years) and producers have rushed to take advantage of this. However, this rush to get supply to market will cause the price to half from $13,375 a tonne to $7,332 a tonne by 2021, and then towards its marginal cost of production at $7,030 a tonne thereafter according to Morgan Stanley’s latest in-depth report into the industry. According to the report, a copy of which has been reviewed by ValueWalk, as a wall of lithium supply hits the market over the next four years, lithium prices could fall by 45% from current levels, a scenario that is not currently reflected in lithium prices. Prices are expected to decline despite the continued growth in demand for lithium-ion batteries. Even though the market for lithium is currently in deficit, this is expected to end by the beginning of next century as the largest producers in Chile, the world’s lowest cost producer of lithium, “threaten to add” around 500,000 tonnes per year to global supply by 2025. This additional supply is expected to “swamp forecast demand growth” according to Morgan Stanley’s calculations. The impact that this additional supply from Chile will have on the wider market cannot be underestimated. Chile and Argentina are the world’s lowest cost producers of the commodity. 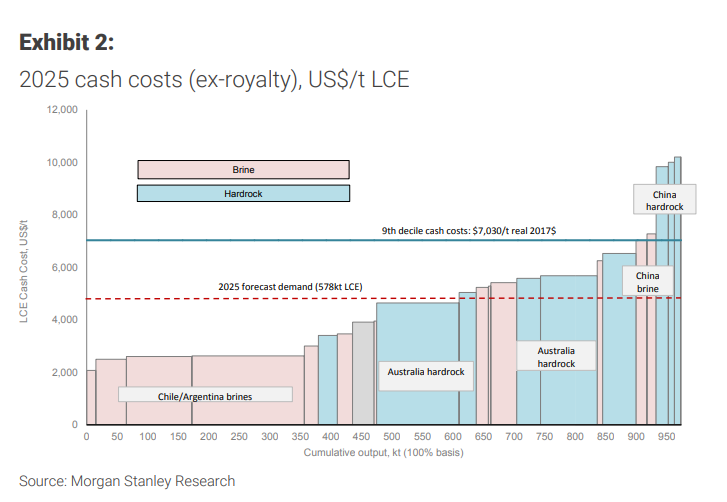 Morgan Stanley estimates that by 2025, the average cash cost in these two regions will be below $4,000 per tonne, that’s compared to cost estimates of around $5,000 or more for production from Australia and China. In fact, some production in China has a cash cost of $10,000 per tonne. 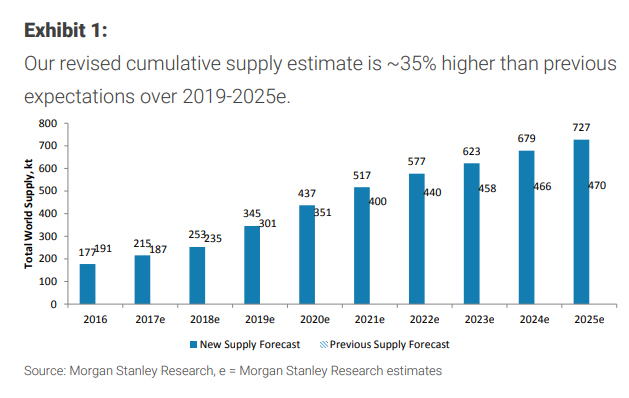 With the average cost of production falling, Morgan Stanley’s analysts expect lithium prices to trend towards $5,000 — unless electric vehicle sales are substantially higher than current estimates. 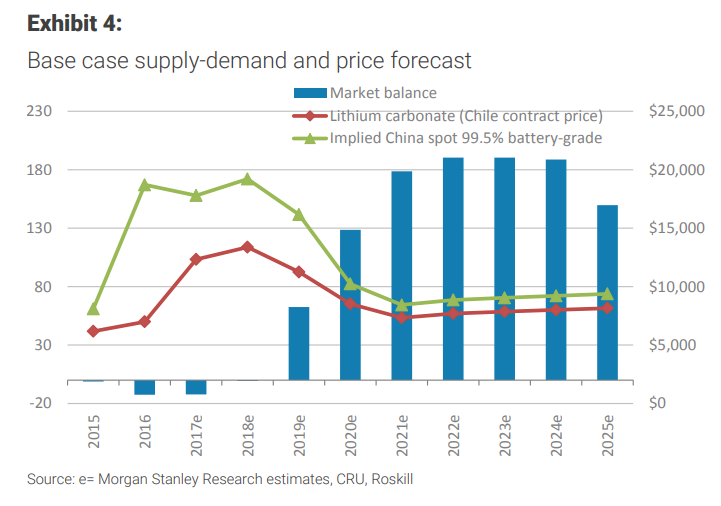 Morgan Stanley’s lithium prices forecast depends entirely on the market for electric vehicles. The bank is currently estimating lithium demand to grow from 228,000 tonnes per annum in 2017, to 578,000 tonnes per annum in 2025, a compound annual growth rate of 12% as forecast battery electric vehicle sales penetration rises from 1.6% in 2017 to 9% by 2025 (9.2 million vehicles).